July 2011 ~ I Can Do That! Sinigang, the Filipino soup which can be very sour or just slightly sour, is Kulinarya Cooking Club theme for this hot hot month of July. Initially, I was not too enthusiastic; first, because of the heat wave we are having here in the US East coast, and second, although I love sinigang and know by heart how to cook almost all sinigang recipes without using the packaged stuff, unfortunately my family doesn't care for it. After thinking if I should prepare sinigang or skip the challenge, I felt it's no big deal to sweat a little and made a small bowl for KCC and for me, of course, because the last time I had was in 2009 and before that was about 20 years ago. This is only the third time I've cooked sinigang. Cut each guava into 8 pieces. Place in a medium saucepan with 2 cups of water. Bring to a boil, cover, and let simmer for 30 minutes or until guavas are very soft and mushy. Strain and press as much pulp through a very fine sieve over a larger saucepan. Discard the seeds and guava pulp that remains in the sieve. Add the rest of the water and onions to the saucepan and simmer, covered, for 10 minutes. Add the next 6 ingredients and gently boil for 5 minutes or until yardlong beans are half cooked. 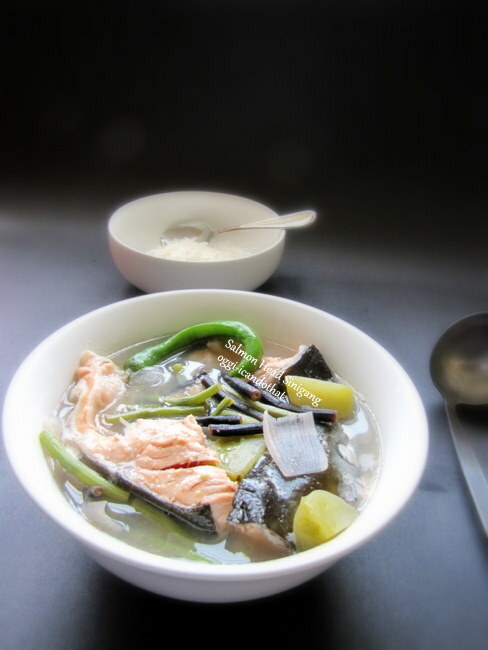 Add salmon head and green peppers; simmer, uncovered, for 3 to 4 minutes or until salmon is fully cooked. Serve over hot rice drizzled with fish extract, if desired. 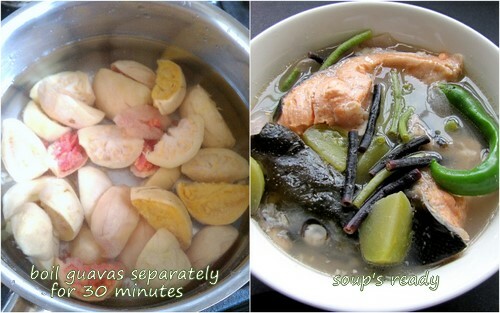 Please visit the blogs of my fellow KCC members for delicious sinigang preparations. Blend all ingredients in a blender or food processor until smooth. Transfer into a container and place in the freezer for 30 minutes to 1 hour. 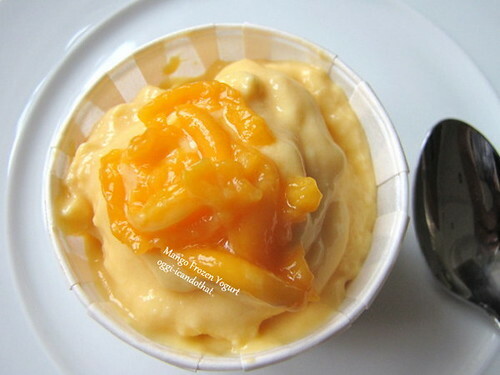 Blend with a hand blender or in a blender and return to the freezer for another 30 to 45 minutes. Stir with a spatula and serve semi frozen. Or process in an ice cream maker and serve immediately. If you can't find Greek-style yogurt, strain regular yogurt in a strainer lined with a round coffee filter set on top of a bowl until yogurt is very thick. 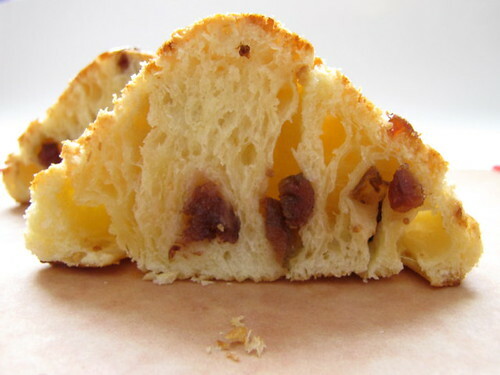 I've been eyeing Laminated Brioche since I bought ADVANCED BREAD AND PASTRY by Michel Suas but have been apprehensive I might fail. 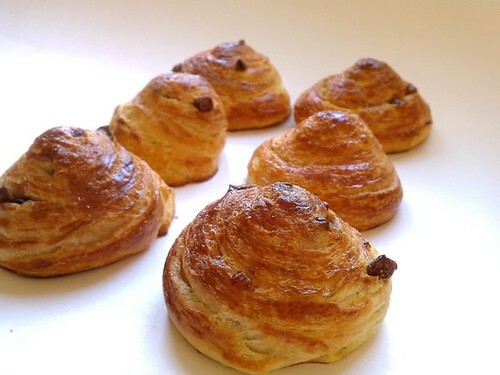 I finally baked them yesterday, the whole process took 2 days starting early morning the first day and finished baking late afternoon the second day. It actually takes 3 days but I'm impatient and I started reeeaaally early in the morning to be able to finish the next day. It was a semi success as you can see from the crumb. There are layers visible but the honeycomb-like layers that I was expecting are missing. I'll surely make them again until I perfect the laminating process for a better looking layered crumb. The rolls are good enough for me at this time as they are delicious and not too rich; the crust is super flaky and the crumb is light, airy, and buttery but not greasy. 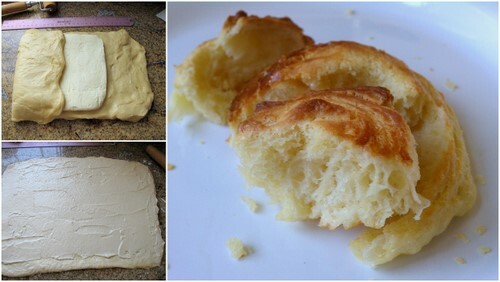 The recipe surprisingly does not have much butter, only a total of 10½ ounces to 16 ounces of bread flour. For the butter block I followed another method because it makes the butter more pliable than just pounding on the sticks to flatten them. Tip: For doughs with higher sugar content it's best to use the appropriate instant yeast such as SAF Gold. The dough will rise better when you use this type of yeast. Mix all ingredients until smooth. Place in a container, cover with plastic wrap, and leave on the kitchen counter for 12 hours. Mix all ingredients in a standing mixer with dough hook attachment. Knead on medium high for 10 minutes. Transfer into a lightly buttered container, cover with plastic wrap and lid, and leave on the kitchen counter for 1 hour. Retard in the refrigerator overnight or for 15 hours. Cut butter into ½ inch slices and place in the bowl of a standing mixer. Sprinkle the flour and beat on low with the paddle attachment until combined, scraping down the sides as needed. The butter should still be cold. Transfer the butter mixture onto a large piece of plastic wrap and shape into a 6-inch square. Refrigerate until needed. Dust the surface lightly with flour. Remove the dough from refrigerator and roll into a 12 x 6-inch rectangle. Place the butter block in the middle and bring both sides to the middle covering the butter entirely. Lightly tap the dough with a rolling pin starting from the center out and roll into a 16 x 9-inch rectangle. Fold 1/3 of the dough over 2/3 of the dough and fold the rest over like a letter. Wrap in plastic wrap and refrigerate for 30 to 45 minutes. Repeat 3 more times, resting in the refrigerator each time. Roll out the dough into 16-inch wide and 1/8 inch thin rectangle. Brush one edge with water, 1 inch wide. Sprinkle with currants and dust lightly with sugar; or spread a thin layer of almond cream, leaving the part brushed with water. Roll from the unwatered side and cut into 1 inch wide strips. Place on parchment-lined sheet pans, tucking the outer end of the strip underneath the center of the swirl. Brush top and sides of swirls with egg wash, lightly cover with plastic wrap and leave to proof for 1½ to 2 hours preferably in a humid place. Brush top and sides of swirls a second time and bake in a preheated 400°F oven for 15 minutes or until golden brown all over. Jana of Cherry Tea Cakes was our July Daring Bakers’ host and she challenged us to make Fresh Fraisiers inspired by recipes written by Elisabeth M. Prueitt and Chad Robertson in the beautiful cookbook Tartine. You can download the recipe from here. 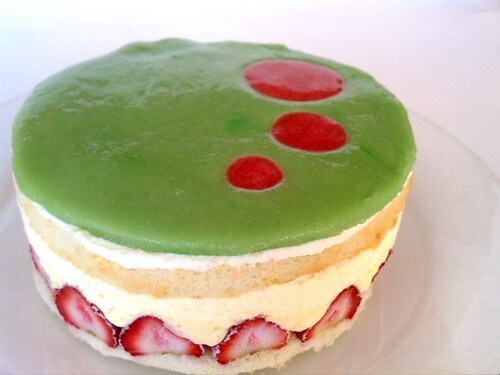 I love the cake a lot; the pastry cream is rich but seems so light and everything goes well together with the wonderful fresh strawberries, of course. Thanks Jana for a delectable and extremely gratifying challenge. The inspiration for the design is as usual from my favorite baking book ADVANCED BREAD AND PASTRY by Michel Suas. 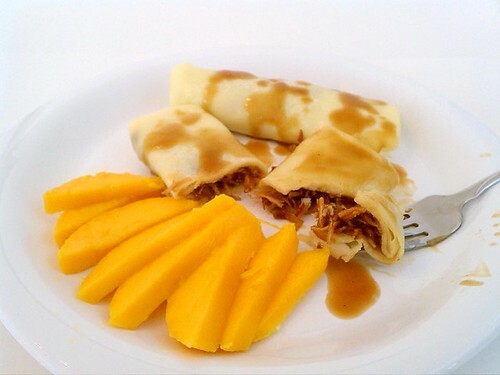 I love crêpes, both sweet and savory. 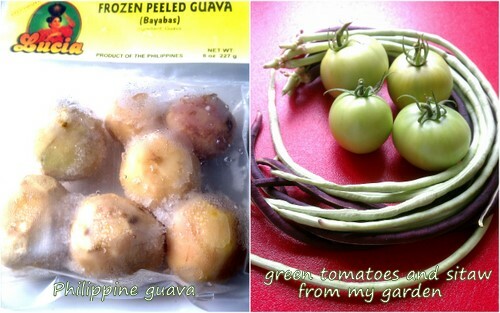 This time I wanted something sweet and Filipino. I filled them with bucayo, rolled them spring roll style, and drizzled with coconut sauce. They're sweet and coconut-y...perfect with ripe mangoes. Have you ever cooked or baked something following the recipe from just drawings or pictures, sort of a rebus baking/cooking. 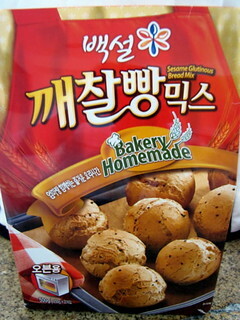 I bought a packet of Korean ready to bake mix glutinous buns with black sesame seeds. The packet doesn't have instructions in English, but at least the ingredients are written in English. 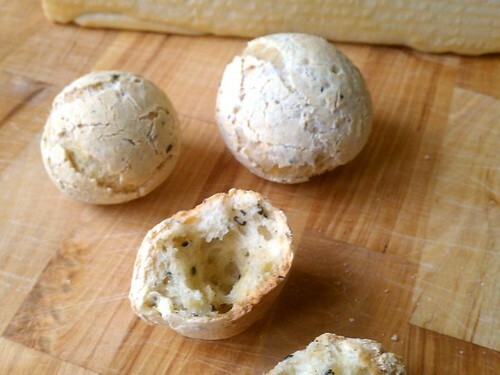 I have guessed from the photo on the package that the buns may be tapioca flour because they look like pão de queijo. These sweet version of the buns are indeed made with tapioca starch, wheat flour, sugar, fat-free milk solids, and other ingredients. The buns are slightly sweet and salty, are crunchy on the outside with airy and chewy crumb. Really really really yummy. 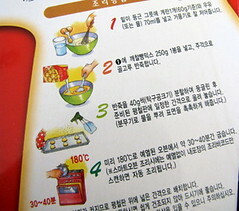 Stir in one 250-gram packet of mix until fully combined. Divide dough into 40-gram pieces, [you'll have about 12 pieces] and place on a sheet pan. Spray with water. Bake in a preheated 180°C (356°F) oven for 30 to 40 minutes or until golden. 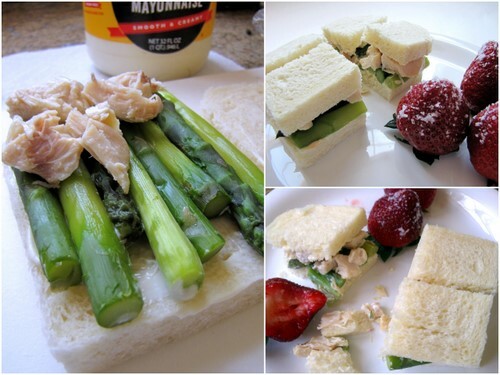 Chicken and Asparagus Sandwich is a family favorite for decades now, specially during the hot summer months. We usually open a can of asparagus but I now prefer steamed fresh. With a tablespoon or two of regular, not low-fat mayonnaise, and chunky cooked chicken breast, this sandwich always satisfies. Today for lunch, instead of baby dill pickles, I had it with strawberries dipped in sea salt. I love the sweet, slightly tart, and salty flavors with the sandwich. Yum! Steph from Stephfood was our Daring Cooks' July hostess. Steph challenged us to make homemade noodles without the help of a motorized pasta machine. She provided us with recipes for Späzle and Fresh Egg Pasta as well as a few delicious sauces to pair our noodles with! Click here for the noodle and sauce recipes. Making noodles from scratch has always been an enjoyable activity for me. 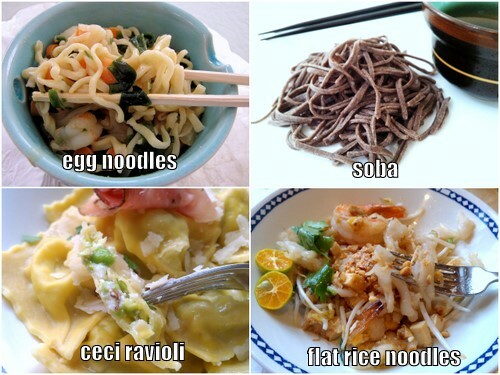 Thanks Steph for choosing homemade noodle for this month's challenge. The one I made from the recipes given was the basic egg noodles. I made everything by hand because I don't have a pasta roller, and rolled as thin as possible which is surprisingly easy. Then I cut the noodles into thin strands using a pizza cutter. I sprinkled some flour on them, made the strands into nests while rolling the rest of the dough. The noodles were boiled right away for a few minutes and mixed with stir-fried vegetables, grated ginger, rice wine, green onions, prawns, soy sauce, and sesame seed oil for a Chinese-style stir fried noodles. Delicious! 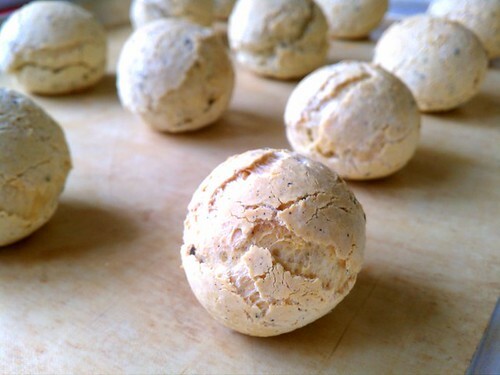 One of the noodle recipes I have wanted to make is the high protein ceci made with chickpea and all-purpose flour, eggs, and olive oil. These noodles are tender, nutritious, and yummy. 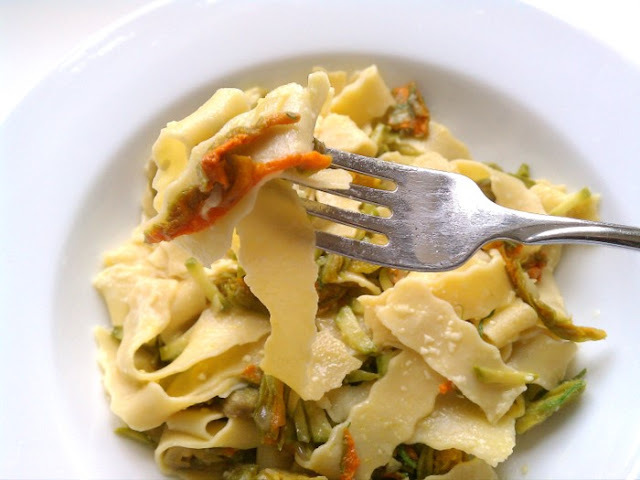 I like them cut into 2 x ¾- inch strips called sagnarelli and simply served with vegetables sauteed in butter and sea salt then topped with Parmesan cheese; These are also good made into ravioli. In a bowl, combine flours. Make a well in the center and add eggs and oil. 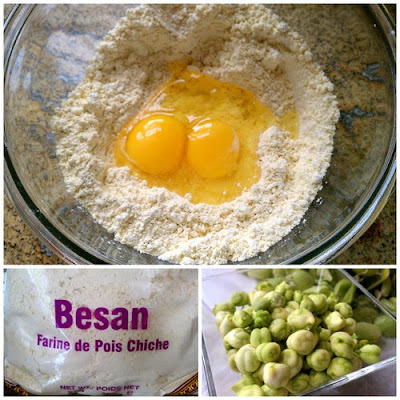 Slowly mix in the flour until combined. Transfer on the counter and knead a few times until smooth. 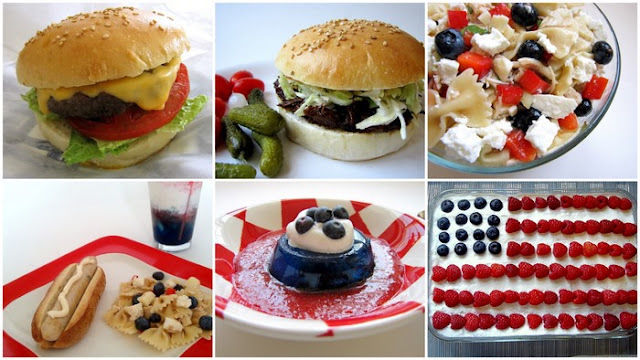 Wrap in plastic film and let rest on the kitchen counter for 1 hour before rolling into desired shapes. I also love rice noodles specially the rice sticks from the Philippines but it may be impossible to find a recipe on how to make them from scratch. However, there are recipes for Chinese and Thai flat rice noodles which have rice flour, tapioca starch, and corn starch. I used a combination of 50% rice flour and 25% each for the remaining flour for a chewy but soft consistency. The noodles are very good with sauteed Chinese broccoli seasoned with oyster sauce, soy sauce, chopped chive, a little hot chili oil, and sesame seed oil. 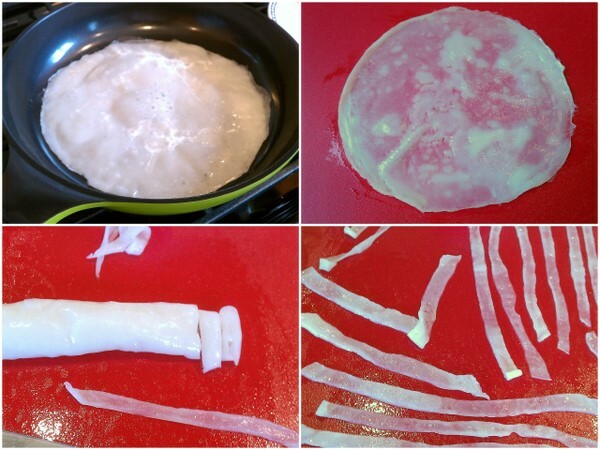 Most of the recipes I found online cook the noodles by steaming but I find it is a lot quicker to cook the crepes on an oiled non-stick skillet. After the crepe has cooled I sprayed some water to make it less sticky, then rolled and sliced them less than ½ inch thick for the pad Thai. They should be sliced into 1-inch thick pieces for other Chinese recipes. Mix all ingredients in a bowl and let rest for 20 minutes. Heat a non-stick skillet over medium heat; brush with vegetable oil. Stir batter and pour about ¾ cup batter, swirling to completely cover the bottom of the skillet. Let cook until transparent. Loosen sides, invert onto a large plate and leave to cool. Spray top with a little water, roll, and slice into desired thickness. Unroll and use immediately. What can I say about the buckwheat noodles...they're just okay and not worth the effort to make at home, in my opinion. But check out the pillow-soft Sweet Potato Gnocchi with Chestnuts and Sage and easy as pie Quark Spätzle I made a few years back. 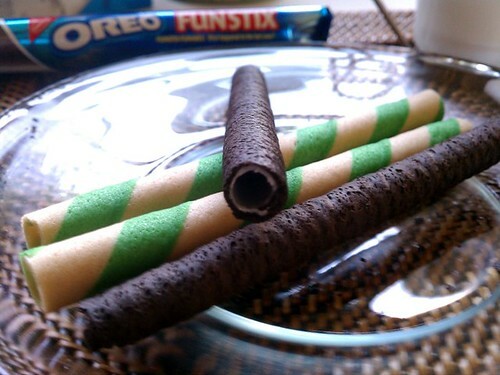 Oreo has come up with its own barquillo snack called Funstix. The crunchy sticks are chocolatey, have a very thin layer of cream inside, and not too sweet. I love them! They're sooo good with iced milk just like my long time favorite, buco-pandan barquillos. I make this simple and easy to make dish often when asparagus is still in season and not too pricey. I sometimes bake it in individual bowls or just cook it in a covered skillet on the stove top to avoid heating up the kitchen. I love that it has more vegetables than meat which are added to flavor the sauce and the vegetables. The usual meat added are Spanish chorizos and ham; the other vegetables are sweet peas and roasted sweet red bell pepper. I omitted the peas and added baby limas instead for added protein. If you can't find or don't like chorizos, other sausages are okay to use with this poached eggs and asparagus dish, but you have to omit the Spanish paprika though and substitute it with regular sweet paprika. In a large non-stick skillet, heat olive oil and saute garlic and onion for 3 minutes; add chorizo, ham, salt, pepper, and pimentón. Let cook on medium heat for 2 minutes. Stir in asparagus, tomatoes, and roasted red bell pepper and let simmer uncovered for 3 minutes. Stir in sweet peas. Make 6 wells and place one egg on each well. Sprinkle a few grains of sea salt on the eggs. Cover and let simmer until eggs are set but yolks are still soft. Remove from heat and drizzle all over with extra virgin olive oil. Serve immediately. 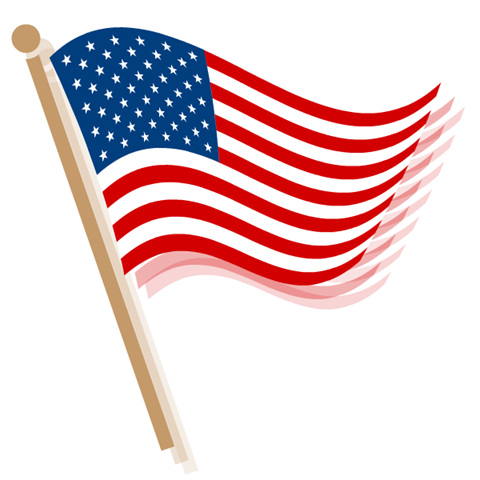 Hope everyone is enjoying the holiday. Now, let's eat!